A morality tale about the courage one man finds within himself to stand up against corruption, On the Waterfront was released in 1954 as, at least partially, director Elia Kazan's justification for testifying in court against the very Communist Party he was a member of. The story of a hot-tempered longshoreman who grows concerned with the criminal activity going on at the waterfront union he works for, the film lacks originality and is mired in clich�s, but more than makes up for these downfalls with the loving treatment Kazan gives the flawed, yet sincere, characters. Kazan and co-screenwriter Budd Schulberg seem intrigued with all concepts of human nature and the role that conscience plays in the choices one makes in life. It is this surprising depth that buoys On the Waterfront above being a typical crime drama. Aside from the villainous gangster union boss, ironically named Johnny Friendly (Lee J. Cobb), all of the major characters in On the Waterfront have redeeming qualities that make them worth caring about. They all have feelings and regrets, and hold the ability to perceive right from wrong, even if their personal situation makes it difficult for them to break their ties from criminal activity. "Conscience," as the protagonist, longshoreman Terry Malloy (Marlon Brando), says near the end of the picture, "That stuff can drive you nuts." Exploited like a pawn by Mr. Friendly, Terry is shaken to discover that he inexplicably plays a role in the murder of a fellow union worker who has ratted out the gangsters controlling the docks of New York. An ex-prizefighter who has seen his former career crash and burn, Terry knows that he owes his waterfront career to Johnny Friendly and his older brother, Charley (Rod Steiger), and it is his devotion to them that leaves him stuck from being able to get out of the profession. In an early scene set at a bar, he is unable to count the wad of bills given to him, and is embarrassed by his illiteracy. Due to his own insecurities, Terry has visibly put up a shield that nearly bars him from getting close to anyone, and is not afraid to get up and fight anyone who labels him a "bum." Throughout much of the film, he consistently puts his brawn before his brain because his low self-esteem leaves him feeling slow-witted and inarticulate. In a lesser movie, Terry would simply be characterized as a man disagreeable with the practices of his boss and coworkers. In the hands of Kazan, however, he is a three-dimensional person with many personal demons and flaws that compliment the outward struggle he is having with the union. Amid everything that is wrong in his life, the externally tough Terry is also portrayed as a caring man underneath. Early in the movie, it is shown that he has a collection of pet pigeons that he keeps on top of the roof of a building. While Kazan never blatantly tells the viewer why he has this fondness for birds, it is alluded to that he is simply taking over the job of caring for them from the now-deceased Joey, due to the guilt he feels for his wrongful murder. Talking to a neighborhood boy named Tommy, Terry instructs him, "Don't spill no water on the floor, cuz I don't want [the pigeons] to catch cold." Terry also finds himself growing to care for Edie (Eva Marie Saint), the grieving sister of Joey, who is determined to find out who the killer is of her brother. As Edie says to her father, who has reservations about her taking a liking to Terry, "He tries to act tough, but there's a look in his eye." She does not know he played a role in Joey's death, and because he recognizes that he has finally met someone he cares for, he is fearful of disclosing the bitter truth. It is not until Terry witnesses the death of his own brother that he finally manages to take a moral stand and fight the union by testifying against them in court. Kazan goes to great pains, and succeeds, at showing the great number of shades any one person has, including their hopes, wounds, and fears. The role of Edie also leaps beyond the conventions of the "romantic interest" to present a strong-willed individual who is, nonetheless, hurting inside. When she sees her brother lying on the pavement, ruthlessly thrown from atop their apartment building, she is devastated, and shows it. "I want to know who killed my brother!" she screams. Meanwhile, her father is more low-key in his reaction, and laments, "Kept telling him. Don't say nothin'. Keep quiet. You'll live longer." The treatment Kazan gives to the different reactions death can have on a person is truthfully brought to life. Instead of waiting around for the police to investigate the murder, Edie takes matters into her own hands, temporarily giving up her schooling to look for the culprit. "I've seen things that are so wrong," she passionately tells her father. "Now how can I go back to school and keep my mind on things that are just in books, that aren't people living?" Edie is appreciative of everything her father has given her, including a solid education, but she also understands that, in times of need, family is more important than the college classes she is taking in Tarrytown. In a conversation with Terry, Edie discusses the meanness in the world, and firmly states that, with "a little more patience and kindness," people would not be as cruel to each other. "Shouldn't everyone care about everyone else?" she questions. When Terry originally has to turn down Edie's plea to help her find the killer, it tears him apart inside, but Edie is understanding about his position. "You would if you could," she says as she strokes him face gently. Despite the horror of losing an innocent brother to a pointless act of violence, Edie proves how far faith and a positive human spirit can help in coming to terms with such a personal tragedy. Takin' Joey Doyle's life to stop him from testifying is a crucifixion...And anybody who sits around and lets it happen  keeps silent about something he knows has happened  shares the guilt of it just as much as the Roman soldier who pierced the flesh of Our Lord to see if He was dead. When a second union worker is killed out of the union's fear that he may testify, Father Barry reads him his last rites. In a symbolic, beautiful sequence that confirms Father Barry is on his way to redeeming his parish, he rides the pallet up and out of the hatch with the body. As the camera follows it slowly rising to the sky, it suggests that the man is going up to Heaven, and Father Barry is leading him to his salvation. Ever since the early 1950s, when director Elia Kazan testified against the Communist Party, he has been largely shunned by his colleagues for betraying a group that he was a part of. 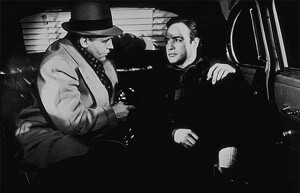 On the Waterfront is his response to the courageous act he himself was a part of. Kazan is adamant in showing that forgiveness and redemption are vital powers of human nature. Although Edie feels betrayed, at first, when he finally admits to playing a part in her brother's death, she cannot help but love Terry. She stands beside him throughout his bold decision to testify against the union, and is able to forgive him for the mistakes he has made in life. In the melodramatic conclusion of the film, Terry triumphantly succeeds in telling the truth of the criminal activity the racketeers are involved in, and his coworkers rally behind him, impressed with his courageous will. The movie has a happier ending than the one Kazan was appointed in his own life, and this was a purposeful decision. Ultimately, On the Waterfront stands as a powerful testament to the faith Elia Kazan has concerning the beauty of positive human nature. Dirks, Tim. Greatest Films. "On the Waterfront." 1996-2001. Ebert, Roger. Roger Ebert on Movies. "On the Waterfront." March 21, 1999. Kazan, Elia. On the Waterfront. Columbia Pictures, 1954.